The 18th China International Petroleum and Petrochemical Technology and Equipment Exhibition (CIPPE 2018), the annual world petroleum equipment conference, was grandly opened at China International Exhibition Center (New Hall) in Beijing from March 27th to March 29th. As a member of petroleum equipment industry, TR Solids Control participated in this grand exhibition, and we presented our dual track shale shaker and high speed centrifuge. They attracted a large number of domestic and foreign customers to visit, and many of customers inquired on the scene and showed high evaluation on them. 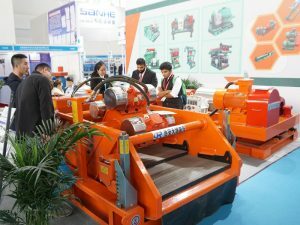 The dual track shale shaker produced by TR Solids Control is a modern new-type shaker integrating the advantages of linear motion shaker and balanced elliptical motion shaker. The drive of this shaker is composed of 2*1 2kw+1.0kw vibration motors. It can meet separation requirements of drilling fluids under various conditions, and it has advantages of large capacity and good separation effect. In addition, our TRLW355*1250 high speed centrifuge is also a major highlight on the exhibition. Its drum is made of 2205 duplex stainless steel by centrifugal casting, which greatly enhances strength and rust resistance. Blades of spiral propeller are inset with hundreds of alloy sheets, making the centrifuge have better wear resistance and longer service life. TR team achieved great success on this exhibition. We not only made publicity for our company and products, but also enabled our customers to have a much detailed understanding about us, and reached a framework agreement for later cooperation. Thanks for all your visiting and support. 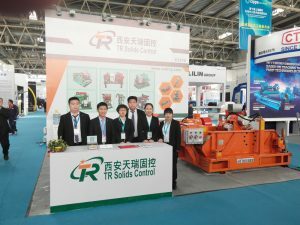 TR Solids Control will serve our customers with professional knowledge and best product continuously.